This type of cable is made of special strength wires primarily for aircraft controls and miscellaneous uses in the aircraft industry. Commercial grade aircraft cable cannot be used for aircraft controls. However, it is used in many general-purpose applications such as slings, winch line, non-aircraft control cables and more. Armstrong-Alar Chain Corporation provides a wide range of aircraft cable. Aircraft cable is available in galvanized steel and Stainless Steel, and is also offered in Stainless Steel Type 316. 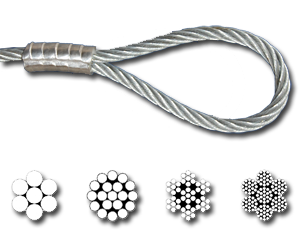 Our aircraft cable comes in 1x7 cable strands, 1x19 cable strands, 7x7 cable strands, and 7x19 cable strands — all in galvanized steel or stainless steel. Aircraft cable sizes range from 1/32" to 3/8", with breaking strengths (tensile strengths) ranging from 120 pounds to 14,400 pounds. Not to be used in any aircraft.